The kidneys, which are two organs that are bean-shaped and which are approximately the size of a fist, are found just under the rib cage on every one of the sides of the spine. The kidneys purify around 120 to 150 quarts of waste, urine, and excess fluid on a daily basis so that there is no waste accumulation in the body. They are responsible for keeping the electrolyte levels stable and they also produce hormones which regulate the blood pressure, keep the bones strong and make red blood cells. The kidneys are very important organs. One needs healthy kidneys so that their body can function properly. Kidneys’ damage can sometimes go unnoticed and it is very important to take a precautionary measure and make sure that your kidneys are healthy. 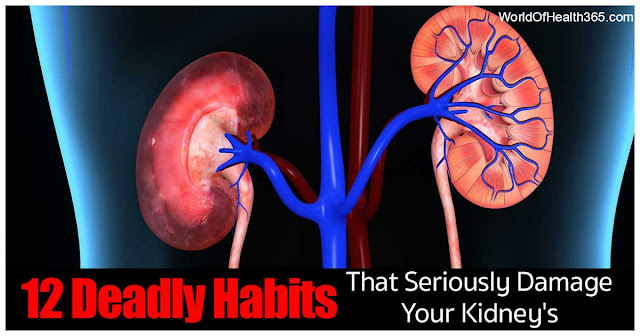 READ ABOUT 8 USUAL HABITS THAT HAVE A BAD INFLUENCE ON YOUR KIDNEYS AND YOU MAY NOT EVEN KNOW IT. One of the main kidneys function is to purify the blood and eliminate waste materials and toxins which can damage the body. If you don’t drink plenty of water, the waste, and the toxins may start to build up and that can eventually cause serious damage. In order to work properly, the body does not require salt, nevertheless, high amounts of sodium can cause damage. The majority of people consume plenty of salts and that can stress the kidneys and can alleviate the blood pressure. According to studies, the odds are that those people who have a few sugary drink per day have protein in their urine. This is an early warning sign that something is wrong with the kidneys. As weird as it sounds, this is quite common. This usually happens in the middle of a car ride or a phone call or when there isn’t a bathroom anywhere near. Nevertheless, if you hold urine regularly it can increase pressure which can then lead to kidney stones and kidney pressure. A healthy diet is vital for the health in general that includes the kidneys as well. There are a number of deficiencies which can increase the formation of kidney stones or lead to kidney failure. Magnesium and B6 are some of them. Caffeine can stress the kidneys and it can alleviate the blood pressure. Too much coffee consumption can cause kidneys damage with time. Eating too much animal protein, red meat, in particular, can elevate the metabolic weight to the kidneys. Eating animal protein in abundance can stress the kidneys and can cause kidneys damage. Constant lack of sleep can cause a number of health issues that also includes kidney disease. The body repairs the kidney tissue while sleeping, so the lack of sleep can make it harder for the tissue to heal. Nobody asks you to spend your whole day at the gym, or even go to the gym, you just need to exercise for 5-10 minutes in the morning. This helps the kidneys to function good, and it also protects it from kidney stones. Studies show that individuals who exercise have lower chances of getting kidney stones. Having a cold or flu too frequently can be a sign of possible underlying health problem. To be fair, all the organs will benefit from regular consumption of a balanced meal.